The RAH Band. Back from the nowhere to be found. Everybody knows ‘Clouds across the moon’. Everybody. Richard Anthony Hewson did not only have a knack for excellent tunes, he also produced this album immaculately (at least for eighties standards. The current iTunes version suffers from excess white noise and sloppy cutting between tracks). The tunes were immediately hummable, the drum computers sounded positively organic, and even the sax solos weren’t too embarassing. And now it’s finally available again. 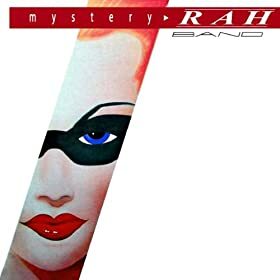 After I’ve been searching for the blody CD for ever and a day (I even struggled on the marvellous Gemm.com) I received a friendly email from The Rah Band’s webmaster (Richard ANthony? You still alive?) letting me know that Mystery is finally available again. This time as downloads on Amazon and itunes, but that was enough incentive for me. The album sounds as fresh and exciting as 23 years ago: the female vocals still haunting and evocative, and the production and songs still unforgettable. A must for every eighties fan and conoisseur of electro pop. Get it here! ← A stunt and the subsequent letdown. I bought the West Germany BMG Records maxi 12″. And that cover design was horrible. And yes, please file me under ‘over 40’ and ‘everybody’. Ah well, you still look 27 though!